Anterior insula (AI) and dorsal ACC (dACC) are known to process information about pain, loss, adversities, bad, harmful or suboptimal choices and consequences that threaten survival or well-being. Also pregenual ACC (pgACC) is linked to loss and pain, being activated by sad thoughts and regrets. Lateral habenula (LHb) is stimulated by predicted and received pain, discomfort, aversive outcome, loss. Its chronic stimulation makes us feel worse/low and gradually stops us choosing and moving for the suboptimal or punished choices, by direct and indirect (via rostromedial tegmental nucleus, RMTg) inhibition of dorsal raphe nucleus (DRN) and VTA/SNc. The response selectivity of LHb neurons suggests their cortical input from affective and cognitive evaluative regions that make expectations about bad, unpleasant or suboptimal outcomes. Based on these facts I predicted direct dACC, pgACC and AI projections to LHb, which form part of an adversity processing circuit that learns to avoid bad outcomes by suppressing dopamine and serotonin signal. 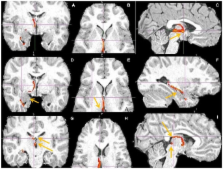 To test this connectivity I used Diffusion Tensor Imaging (DTI). I found dACC, pgACC, AI and caudolateral OFC (clOFC) projections to LHb. I predicted no corticohabenular projections from the reward processing regions: medial OFC (mOFC) and ventral ACC (vACC) because both respond most strongly to good, high valued stimuli and outcomes, inducing dopamine and serotonin release. This lack of LHb projections was confirmed for vACC and likely for mOFC. The surprising findings were the corticohabenular projections from the cognitive prefrontal cortex regions, known for flexible reasoning, planning and combining whatever information are relevant for reaching current goals. I propose that the prefrontohabenular projections provide a teaching signal for value-based choice behavior, to learn to deselect, avoid or inhibit the potentially harmful, low valued or wrong choices, goals, strategies, predictions and ways of doing things, to prevent bad or suboptimal consequences. The techniques available for the interrogation and analysis of neuroimaging data have a large influence in determining the flexibility, sensitivity, and scope of neuroimaging experiments. The development of such methodologies has allowed investigators to address scientific questions that could not previously be answered and, as such, has become an important research area in its own right. In this paper, we present a review of the research carried out by the Analysis Group at the Oxford Centre for Functional MRI of the Brain (FMRIB). This research has focussed on the development of new methodologies for the analysis of both structural and functional magnetic resonance imaging data. The majority of the research laid out in this paper has been implemented as freely available software tools within FMRIB's Software Library (FSL). Linear registration and motion correction are important components of structural and functional brain image analysis. Most modern methods optimize some intensity-based cost function to determine the best registration. To date, little attention has been focused on the optimization method itself, even though the success of most registration methods hinges on the quality of this optimization. This paper examines the optimization process in detail and demonstrates that the commonly used multiresolution local optimization methods can, and do, get trapped in local minima. To address this problem, two approaches are taken: (1) to apodize the cost function and (2) to employ a novel hybrid global-local optimization method. This new optimization method is specifically designed for registering whole brain images. It substantially reduces the likelihood of producing misregistrations due to being trapped by local minima. The increased robustness of the method, compared to other commonly used methods, is demonstrated by a consistency test. In addition, the accuracy of the registration is demonstrated by a series of experiments with motion correction. These motion correction experiments also investigate how the results are affected by different cost functions and interpolation methods. FSL (the FMRIB Software Library) is a comprehensive library of analysis tools for functional, structural and diffusion MRI brain imaging data, written mainly by members of the Analysis Group, FMRIB, Oxford. For this NeuroImage special issue on "20 years of fMRI" we have been asked to write about the history, developments and current status of FSL. We also include some descriptions of parts of FSL that are not well covered in the existing literature. We hope that some of this content might be of interest to users of FSL, and also maybe to new research groups considering creating, releasing and supporting new software packages for brain image analysis. Copyright © 2011 Elsevier Inc. All rights reserved. This article was submitted to the journal Frontiers in Human Neuroscience. Copyright statement: Copyright © 2014 Vadovičová. This is an open-access article distributed under the terms of the Creative Commons Attribution License (CC BY). The use, distribution and reproduction in other forums is permitted, provided the original author(s) or licensor are credited and that the original publication in this journal is cited, in accordance with accepted academic practice. No use, distribution or reproduction is permitted which does not comply with these terms. Dissociable regulation of instrumental action within mouse prefrontal cortex. Reward and adversity processing circuits, their competition and interactions with dopamine and serotonin signaling.